Your Wedding Day is the most important day of your life. Where making you look your best, makes us look our best! Next to your dress, your hair and makeup are the most important part of your beautiful Bride image. We strongly recommend you schedule your Trial Bridal Style and your Trail Photographic Makeup three weeks before your Wedding to ensure enough time to finalize that perfect look. Feel free to bring photos of your desired style and makeup and remember to bring your veil! 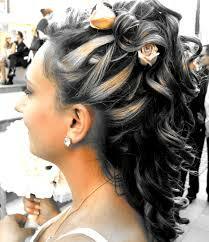 As always, our professional stylists and makeup artists will assist and advise to create a look that is best for you. Do you have highlights or get regular color retouches? How about perms? We advise that all chemical services be done two weeks before your wedding date. Today’s the day! Your Bridal Style and Bridal Makeup will be completed just hours before your wedding. Encourage your bridal party to schedule their hair and makeup services this day as well. It’s very important to have professionally styled hair and the correct photographic makeup to withstand the demands of a wedding. Our professionals will make sure your look holds up under harsh photographic lighting and then carry you through the rest of a long exciting day. When booking Special Occasion Makeup & Styling for your bridal party, please make sure all names, phone numbers and length of hair is given. *Our Artists are true professionals and well known for their work! *Common mistakes brides make are overstating or understating their makeup. Our makeup Artist applies your makeup to perfection so you will feel and photograph like a super model. All waxing should be scheduled three to five days prior to your wedding, to guarantee you skin is soft and smooth for the honeymoon, but not irritated. Please allow at least two weeks hair growth before you receive these services. *Please be advised that waxing should not be done during your menstrual cycle or while taking certain acne medications. Check out our Hairpieces & Garters too!!! Gift Certificates are the perfect thank you gifts for your Bridesmaids and Groomsmen. They are also the perfect shower oR wedding gift for you and your husband to be!